Your goal in this semester long project is to use both culture-based and culture-independent methods to investigate the abundance and diversity of bacteria in a soil community and to explore how this population functions as a community, both co-operatively and competitively. 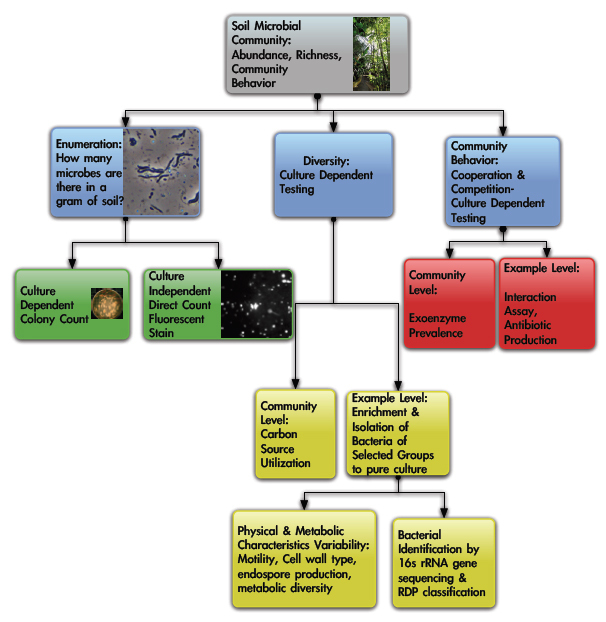 We want to detect examples of ways that microbial soil community members support and exploit each other and their ecosystem. In the 1980's scientists discovered that, despite the unicellular character of microorganisms and their invisibility to us, the microbial world is much more diverse and numerous than the macroscopic world of plants and animals. We now know that microbial communities are as complex and interdependent as those of visible forms of life. Traditional measures of diversity relied on physical traits and assessment of microbial metabolism was used for microbial identification rather than for understanding community structure and organization. The use of physical traits in determining relationships between organisms has several major problems when it comes to microbes: 1) microbes are not as morphologically diverse as metazoans; 2) their morphological traits are not indicative of evolutionary relationships; 3) there are no morphological traits common to both macroorganisms and microbes. In the 1980's Carl Woese suggested that ribosomal RNA sequences could be used to measure relatedness among radically different organisms. Ribosomes, the protein-RNA complexes that are the scaffold on which proteins are synthesized, are common to all cells, both prokaryotic and eukaryotic. Despite differences in size, the sequences of rRNA molecules contain regions that are highly conserved, thus highly similar. Woese's ground-breaking work altered the tree of life and showed that the prokaryotic world was evolutionarily much older than expected and much more important. Once PCR was available, Woese and others that followed, used the genes that encode ribosomal RNA (rRNA), 16S rRNA in prokaryotes and 18S rRNA in eukaryotes, to continue to examine phylogenetic relationships because this gene was large enough to contain enough information for genetic comparisons but small enough for the gene to be sequenced easily. Comparing sequences of the gene (16S DNA) that encodes 16S rRNA in different bacteria can be used to identify them with much greater accuracy than traditional identification tools that used a battery of metabolic and physical tests on cultured community members. It is also common now to use ribosomal DNA sequencing to deduce phylogenetic relationships between different bacteria and among organisms as diverse as bacteria and humans. Such advances in molecular tools for gene sequencing and in other types of microorganism identification dramatically expanded our knowledge of the contribution of microbes in their (and our) environment. It is estimated that 99.9% of microbes are "unculturable" - that is, currently not able to be cultured by traditional methods. The large number of these uncultured bacteria are responsible for the, so-called, "Great Plate Count Anomaly": the recognition that many more bacteria are present than appear as colonies on agar plates. Culture-independent estimates of the number of bacteria in a gram of soil are 109 - this is several hundred to 9,000 orders of magnitude greater than the number derived from culture-dependent methods. It has been speculated that there might be 10 billion species of bacteria on Earth! We would like to thank Irene Newton, William VonSiegler; Charles Deutsch, Patricia M. Steubing; Stephen C. Wagner and Robert S. Stewart, Jr.; Kyle Seifert, Amy Fenster, Judith A. Dilts, and Louise Temple; and the instructors of the Microbial Diversity Course at the Marine Biological Lab in Woods Hole, MA for their valuable assistance in the development of these labs. This page was last edited on 3 February 2013, at 12:49.